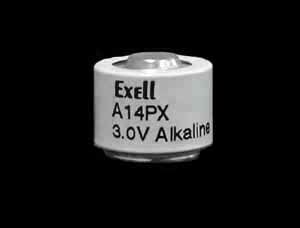 A14PX V14PXA A14PX PX14A mercury replacement alkaline batteries for PX14, 2MR9, EPX14, V14PX, H-2D. Type: Alkaline. Voltage: 3.0 V.
Diameter: 16.9 mm. Height: 15.4 mm. Price: £6.83 each. £6.40 each if you buy two or more. Postage and packing included. Also known as: V14PXA / A14PX / PX14A / TR112. 3.0 V Replacement for: PX14, 2MR9, EPX14, V14PX, H-2D, HS-2D, KM-2D, TR-112, TR-122R. The A14PX or PX14A is a mercury-free replacement for the once popular Mercuric Oxide PX14 or EPX14 cell that was commonly used in cameras. Mercury cells are now banned because of toxicity and environmental fears. The A14PX or PX14A is likely to be your only choice of battery replacement. Consider buying more than one. These Alkaline cells have a shelf life of several years, so buy two and make sure you always have a ready supply of power for your device whilst taking advantage of our reduced price multi-buy offer. The "Rolls Royce" mercury free replacement can be used again and again is the PX14 Adapter which takes two silver oxide cells and contains micro electronics that drop the voltage from the silver oxide cells to the 2.70 Volts that your light meter or camera was designed for. No adjustment or modification to your device is required. The PX14 Adapter does not require activation or a supply of air. The PX14 Adapter and silver oxide 357 cells has a significantly longer battery life than a pair of zinc air WeinCELL MRB625 batteries.